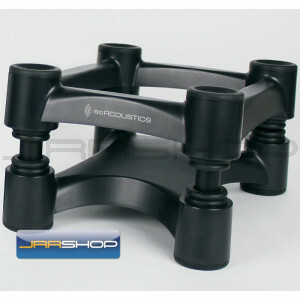 IsoAcoustics ISO-L8R200 stands provides a high level of acoustic isolation with a unique patented design that allows the speakers to “float” while maintaining all movement on-axis to improve clarity. With 14 variations in height and tilt adjustments, they can be used on desktops, meter bridges or floor mounted stands to optimize studio monitor placement and focus. Subwoofers come alive with tighter bass punch and superior bass decoupling. IsoAcoustics stands are ideal for professional, home studios and other desktop applications. The ISO-L8R200 stand has an overall size of 8”(W) x 10”(D) and can be configured to either the 4” or 8” height. Perfect placement and focus of the speakers can be attained with multiple adjustments, tilting up or down to as much as 6.5 degrees, to suit any application.